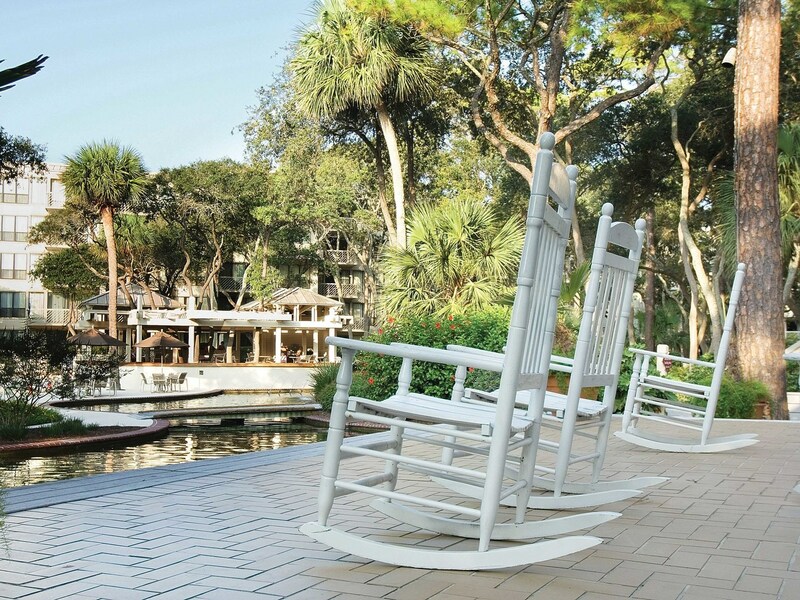 Marriott's Monarch timehare resort is a great vacation getaway located on the beautiful Hilton Head Island, South Carolina. Beach lovers have turned this timeshare resort into a world-class destination favorite for those seeking a well-kept sun and surf environment. All guests have praised the excellent customer service and the serenity of this pristine natural environment. There are 12 miles (19 kilometers) of beach property on Hilton Head Island. The climate and environment are ideal for every vacationer. The island was a key location in the cotton trade before the Civil War. African-American freedmen have created a vibrant community, which dates back to the Union army control of the area. The local government has enacted strict land development policies to maintain an "eco-friendly" landscape, restricting damaging construction or industrialization. Buildings are developed to fit in properly with existing trees. As a result, Marriott's Monarch at Sea Pines timeshares have a wide selection of older-growth vegetation cover, Spanish Moss and tremendous Oak trees. Perfectly suited in a relaxing environment to escape the stress of hectic work; a timeshare resale at Marriott's Monarch offers privacy and security in its guarded, gated walls. Southern charm awaits the vacationer, who will be impressed with top-notch customer service. Premier Timeshare Resale can help you find the best deal on Marriott's Monarch at Sea Pines timeshares for sale. Numerous recreational attractions await the energetic visitor: Atlantic Ocean beaches (white sand beaches, umbrellas to shelter from sun), Baynard Ruins, Daufuskie Island, Harbour Town Golf Links (great well-manicured courses) and Old South Golf Links (18-hole course 6,772 yards). Hilton Head has more than twenty premier golf courses to choose from. The Verizon Heritage golf event takes place on Hilton Head. Other popular activities available include biking, horseback riding, jogging, sailing and tennis. The Marriott's Monarch timeshare resort is located on six acres of land. It has multiple pools to relax your aching muscles. Marriott is an expert in treating guests right. It excels at clean, attractive, newer, well-kept facilities with bright colorful decorations. Marriott's Monarch timeshare resort has a smoke-free policy. The villas have two bedrooms (master and guest) and two baths, with private balconies. Big, fluffy beds await the tired visitor. The living and dining areas are separate. There is a well-stocked, modern kitchen and elegant dining room for entertaining guests, customers and clients. The convenient pull-out and rollaway beds make it so the rooms can accommodate up to six guests. The rooms have a master whirlpool bath, air conditioning, clock radio and safe. Visitors can use the high-speed wireless Internet access and cable/satellite television to keep connected to the outside world. All of these amenities make it easy to buy a Marriott's Monarch timeshare because everything you need is already included. The property is quite secure, nestled amongst other "guarded gated communities." There are great bike and walking paths along and on the beaches. A private beach entrance allows for easy access. The Marriott's Monarch has a fitness center on-site with cardiovascular and free weights. Other basic services include free board games, babysitting and pizza delivery nearby. Those who are looking to buy or sell a Marriott's Monarch timeshare should trust in the professional realtors at Premier Timeshare Resale. Selling a Marriott's Monarch at Sea Pines is easy to accomplish due to its well-known reputation. This is a peaceful, restful environment - well-known by the travelling public. Some villas offer great oceanfront views.